From the mix of all things good department... 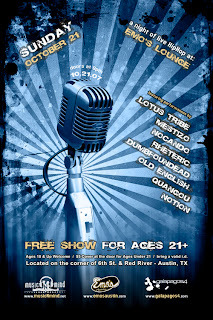 Mestizo, Nocando, Rheteric, Dumbfoundead, Old English, Quangou, Lotus Tribe, Notion @ Emo's on Oct 21st. Get up and check out some hip hop on a Sunday night... Free too... can't beat that. MESTIZO - The Bona fide one of a kind multifaceted emcee who embodies the true sound of his California roots, but has acquired dexterity from all the city's Like Chicago, he has known to call home. Born to a Filipino father from California and a Sicilian mother from New York, this Bay Area native is the living definition of his name... MESTIZO. The Tagalog and Spanish literal translation for of "mixed races" and he is the spokesman for the new breed of human and the new generation man. Mestizo has acquired the respect and admiration of his peers and elders alike, from Battling and Freestyling to writing and recording a song in 10 minutes, Mestizo known for his savage ability for emceeing and Humanitarian qualities. A seasoned road warrior, who has tour the US, Europe and Japan, many times over, Pumping fire into the blood of his audience and creating a whole new fan base. Now on his Senior album Mestizo's movement is picking up the momentum it needs to make the impact he is aiming for. Mestizo exemplifies the power of word and applies old methods of guiding the people to truth through speech. Mestizo carries the torch for tradition as the many great emcees before him, with his adroit word patterns, a library of styles and apocalyptic vision. he is the blueprint for any human trying to be more than Arbitrary and be ineradicable in the history books. Mestizo will make his mark on man in our lifetime, as each album puts him higher in position to obtain his true goal of a creating a Mestizo Nation.